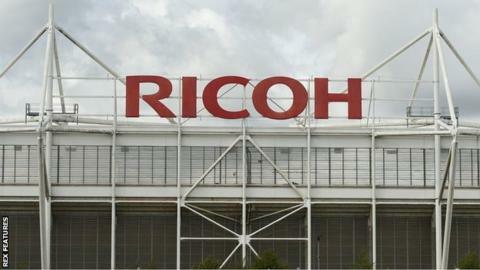 Coventry City's owners have publicly promised an end to their legal action against the local council over the sale of the Ricoh Arena if they get support to build a new home in the city. Sisu Capital Ltd will drop the long-running case if they can move - but are also seeking a medium-term deal with Wasps to remain at the Ricoh for now. City were given an English Football League deadline over next season. They hope their new plan is approved at the EFL board meeting on 2 April. If it is not resolved by then, EFL clubs will be notified about a meeting, which would take place on 25 April, at which Coventry could face expulsion from the league. The legal case hinges on their claim that Coventry City Council undervalued the Ricoh by £28m when the ground was sold to Wasps in 2014. Sisu say they "typically do not make press comments" but that they are "breaking with that tradition, because we think it essential that we explain to the fans the status of Coventry City Football Club." A stadium development supported by the council in Coventry with enabling development on reasonable terms. A medium term interim arrangement with Wasps on commercially acceptable terms to stay at the Ricoh Arena until CCFC's own stadium is complete. Coventry first moved to the Ricoh Arena in 2005 after selling their former home at Highfield Road. They returned in 2014 after just over a year ground-sharing 33 miles away with Northampton Town, but have been told by the EFL that they must play their home games within six miles of the city centre. Sisu say they are inconvenienced by the EFL stipulation over the geographical location of any new stadium - and have also outlined other potential obstacles arising from the "current acrimonious relationship" with the council. However, in a background document to go with their open letter, they say they have "invested considerable time and money in exploring the construction of a new stadium" and that "real estate advisors have been and continue to be engaged to source land for such a development". Sisu add that they are "still hopeful" that the council will work with them to progress the development of a new ground.